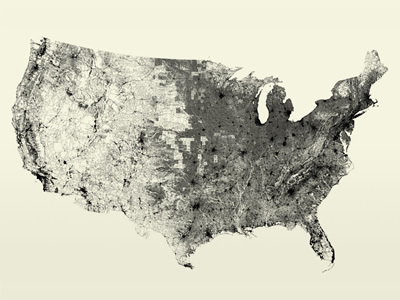 This visualization by Ben Fry depicts all of the streets in the lower 48 United States: an image of 26 million individual road segments. No other features (such as outlines or geographic features) have been added to this image, however they emerge as roads avoid mountains, and sparse areas convey low population. Alaska and Hawaii were initially left out for simplicity's sake, but then Ben Fry felt guilty because of the sad emails he received. However, he made the final decision of leaving them out permanently because the two states didn't "work", since there aren't enough roads to outline their shape. 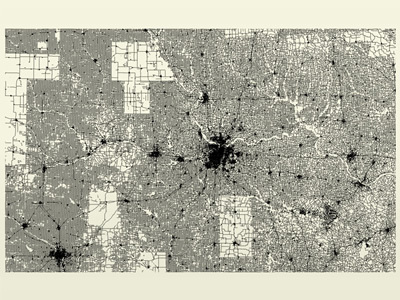 The first image depicts all 48 states while the second shows a detail view into Kansas City, where the white blocks seem to be rural routes and unnamed roads.